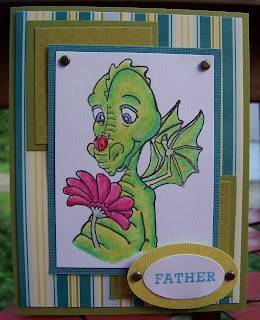 I used the sketch from Critter Sketch Challenge Blog for this card. Image is Sweet Pea Dragon Luck from Paper Jewels colored in with Prismacolor pencils and blended with OMS. Cardstock is SU Old Olive and the rest of the paper is DCWV. Brads are SU vintage brads. Sentiment is PTI Mega Mixed Messages. Ovals were made with Fiskars punches. This is adorable. I love your colouring.. that dragon is amazing! So sweet, that image is great, and pairing it with that dp ties it in well for a fathers day card :-) Have a great weekend. wonderful card and your coloring is fantastic! Thanks for playing the Critter Sketch Challenge. Cute card! The paper is perect for Father's Day. Too cute!! What an adorable card for Father's day. Great take with the sketch, Thanks for joining us this week on the Critter Sketch challenge. Really cute Card! I love how you coloured the image. I love the little bug on the dragons nose, so cute! Thanks for playing along with the Critter Sketch CHallenge. I LOVE this stamp. I just bought one as well. Great card and fabulous job with the sketch. Thanks for playing with us at Critter sketch challenge! Your coloring on this is amazing! Great job! I love this image too! Nice layout!!! Such a fun image, wonderful coloring! Thanks for playing at the CSCB. Such a great card! Adorable image and super coloring job! !